Radar for Fraud Teams helps you fine-tune how Radar operates, create custom fraud rules, and optimize manual reviews. Get fraud insights and assess your fraud management performance from a unified dashboard. 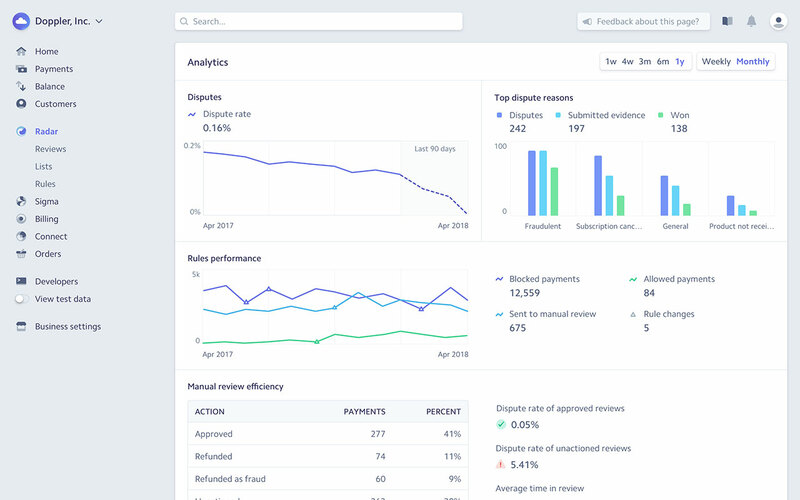 From writing rules to reviewing payments, everything can happen in the Dashboard—there’s no code or setup required to get started. You can also easily integrate with existing workflows using webhooks and real-time notifications. Write expressive rules to reflect any unique business logic using a variety of attributes, including IP addresses, card details, velocity counters, metadata, and more. 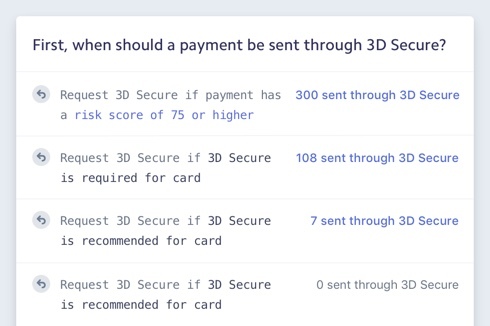 Use Dynamic 3D Secure to apply additional authentication based on your customer risk profile, or on SCA requirements. 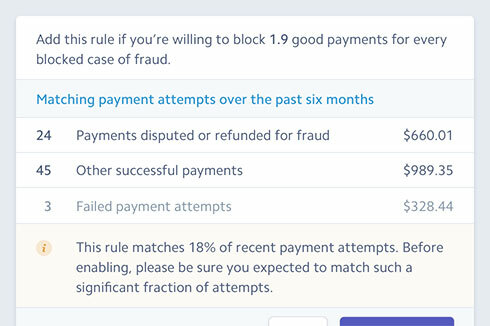 Depending on your business’s appetite for fraud, you can maximize revenue by using Radar’s numerical risk score to tweak the threshold at which to block payments. 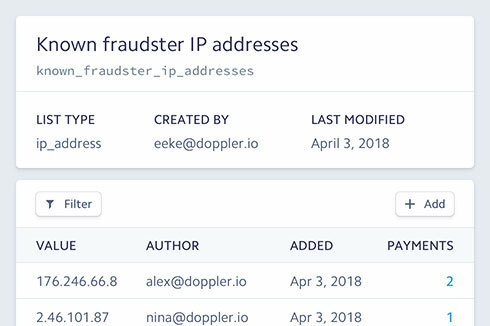 Fraud teams now have an easy way to create and maintain lists of attributes—card numbers, emails, IP addresses, and more—that you’d like to consistently block or allow. Equip your teams to better detect fraud patterns and take action quickly. 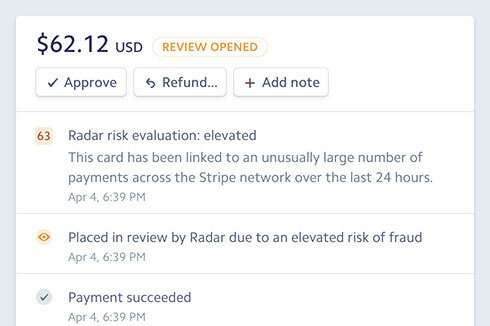 Stripe’s optimized workflows slash the time it takes to review payments. Catch common fraud patterns such as card testing or trial abuse by evaluating payments holistically rather than in isolation. We surface previous related payments your business has processed that match certain attributes like email address, IP address, or card number. Fraudulent purchases often look atypical in comparison to legitimate sessions. When reviewing payments, you can view relevant info data related to the device used, compare the geolocated IP address and the credit card address, or see whether the purchase pattern is anomalous compared to typical legitimate payments for your business. 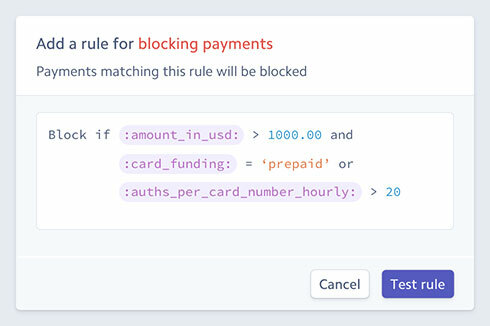 Blunt rules can adversely impact revenue, so Radar backtests on historical payments data to let you know how rules will impact your business before applying them to live payments. Radar cut our fraud rates by over 70% without any configuration, saving our pizzerias thousands of dollars every month and allowing us to focus on delivering the best local pizza experience possible. Radar dramatically reduced manual review work and saved Teespring creators from shipping t-shirts to fraudulent customers. Our team protects the Postmates platform from fraud while still providing a great customer experience. Radar hums in the background on every transaction and Radar’s models have been very helpful for separating good transactions from bad. Radar’s related payments feature helped our fraud team quickly spot a nuanced fraud ring and avoid significant potential loss. It’s been a great asset in our fraud detection arsenal. Radar automatically helped Watsi prevent more than $40M in fraudulent donations over just a two-month span. Radar’s advanced machine learning engine learns from hundreds of billions of data points across the Stripe network to help millions of businesses fight fraud. with standard 2.9% + 30¢ pricing. Accounts on custom pricing plans pay 4¢ per transaction. An optional add-on bundle of powerful tools to support fraud fighting professionals. per transaction In addition to payments processing fees. Join thousands of fraud professionals. Radar for Fraud Teams helps you fight fraud and increase revenue.